Express your love in a creative way with this prompt-filled, handmade journal. 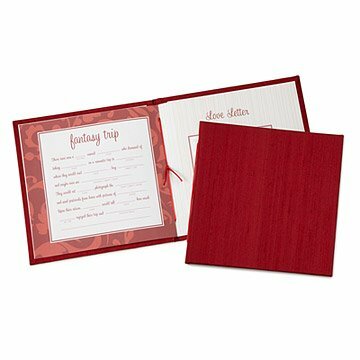 We all could use a little help in the romance department from time to time, and this sweet keepsake book is a unique way to tell someone you love them. Hand bound in Rhode Island by Jason Thompson, "12 Ways to Say I Love You" is a book which encourages you to explore your relationship and tell your partner how you feel in a creative, personal way. With inspirational teasers such as "My favorite way to spend the day with you..." and "The top five songs that make me think of you...", this little journal has plenty of room for notes, photos and small keepsakes, and is sure to make a big impact with someone you love. This product is handmade and very personalized. It's a great product that I plan to make and give to my boyfriend ! I bought this for a wedding gift, and they loved it! Perfect for your significant other. I bought it as a first anniversary gift for my husband. I was very uncomfortable writing a biography, so I chose to cover it up with a picture of us. It really needs an extra blank page for each customer's individual creativity! Best anniversary gift out. I struggle to be creative but this guided me through the process and was enjoyable. Takes a couple hours to fill out but well worth the time. Could not be any happier with the gift. Gets you thinking about all the special times while making. As advertised and easy to follow. However, realize that you will need to spend an hour or 2 to complete this well. so customizable, was able to add cute little embellishments that made it all very special. I really enjoyed the prompts because they made me think of different ways to express my love! excellent gift for your special someone. Wanted something special & personal for husband's Christmas gift. The book looks aesthetically nice, and seems to be of good quality. It only has 12 pages plus a page for photo & to/from page. I could do w/o the "Top 5 Songs" & "Fantasy Trip" pages. A few extra blank pages to use as wanted would have been nice. A bit on pricey side, but I'm assuming it's because its hand-made. This product is wonderful. I'm sending it to my boyfriend for Valentine's Day while he's deployed. The front has a page where you can tape in a 4x6 photo and the other pages contain thoughtful prompts to help you start writing about the other person. Definitely worth the price considering how meaningful it will be to the recipient. I haven't yet given this gift to my husband, but I know he'll love it. The prompts to get you started in completing the book were perfect. What a wonderfully romantic idea!